WITHIN TEMPTATION - MOTHER EARTH EXPANDED EDIT. COLOURED VINYL (LP) | Online Shop | Wizard LTD. Album: "MOTHER EARTH EXPANDED EDIT. COLOURED VINYL (LP)"
• AVAILABLE AS 5.000 INDIVIDUALLY NUMBERED COPIES ON COLOURED (SOLID BLUE, SOLID YELLOW & SOLID RED MIXED) VINYL! 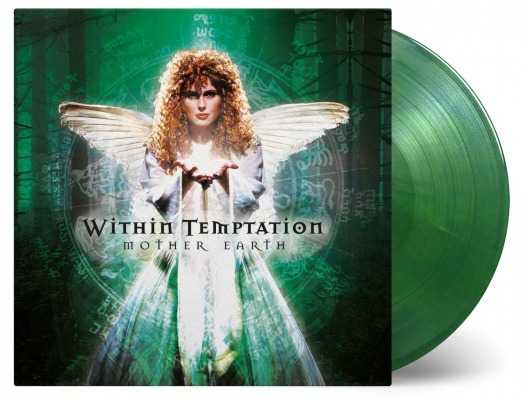 Mother Earth is the first album by the Dutch metal band Within Temptation. Featuring Sharon den Adel as the only vocalist the direction of the band changed from their doomy sound from the former EPs to a more symphonic style. The title song opens with a beautiful orchestral melody before powerful drumming and guitar riffs pumping in. “Ice Queen” reached number one in both the Netherlands and Belgium. With its prominent string arrangement and lyrical content it was a fine song in the early zero’s. Overall Mother Earth is an emotive and thoughtful collection of musical ideas overridden by some impressive vocal expressions. The Dutch symphonic metal band Within Temptation was founded in 1996 by vocalist Sharon den Adel and guitarist Robert Westerholt. After their first recordings in the doom metal they were developing their music to a more accessible symphonic style, becoming known to the worldwide public. Mother Earth is available as a limited edition of 5.000 individually numbered copies on coloured (Solid blue, solid yellow & solid red mixed) vinyl.